It was a good week for weird dinosaurs. 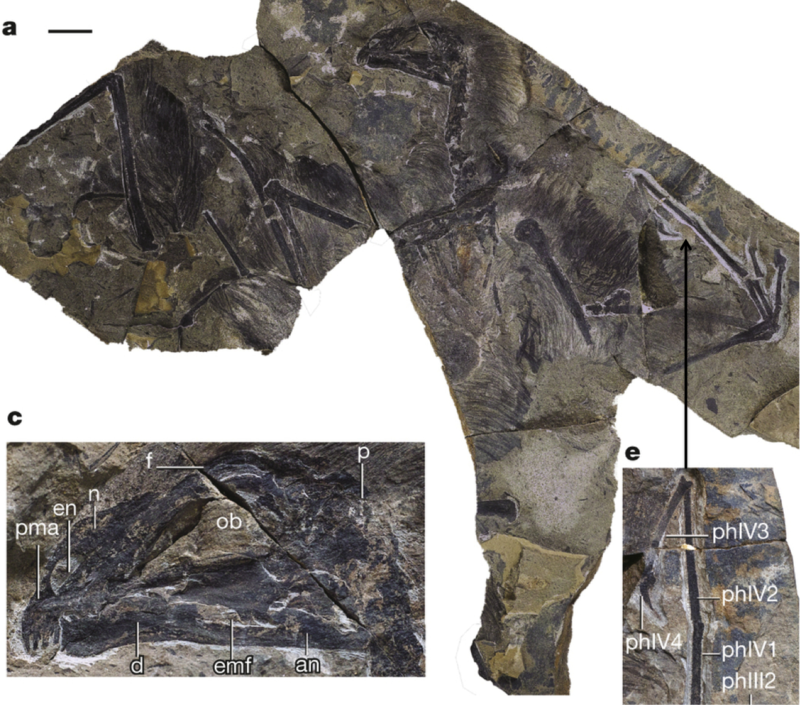 On Monday scientists published Chilesaurus, “an enigmatic plant-eating [dino] from the Late Jurassic period of Chile” (from the paper title). Even more curious, Xing Xu and colleagues announced Yi qi, a Skeksis-like nightmare from the Jurassic of what is now China. Yi qi on its deathbed, refusing to go quietly. 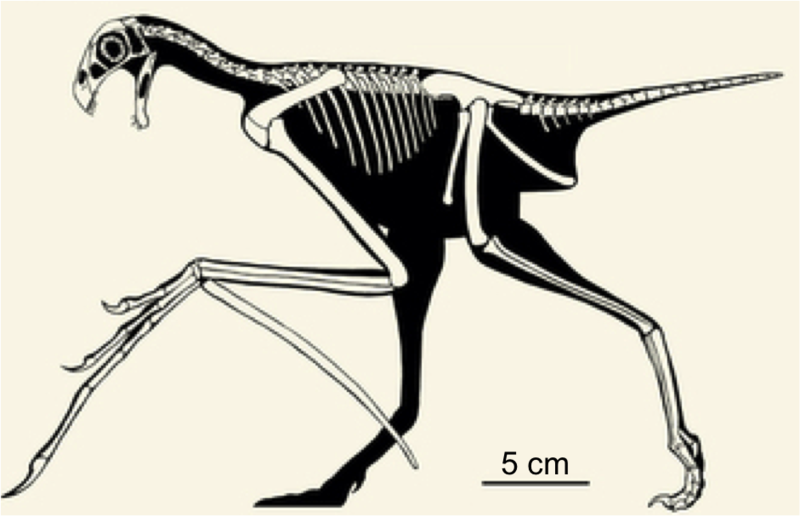 The Yi qi partial skeleton (Figure 1 from Xu et al.). Inset c is a closeup of the skull, and e a closeup of the elongated finger bones. Lookit that majestic mane of feathers flowing from the back of its head and down its neck. The rest of Figure 1 from Xu et al. 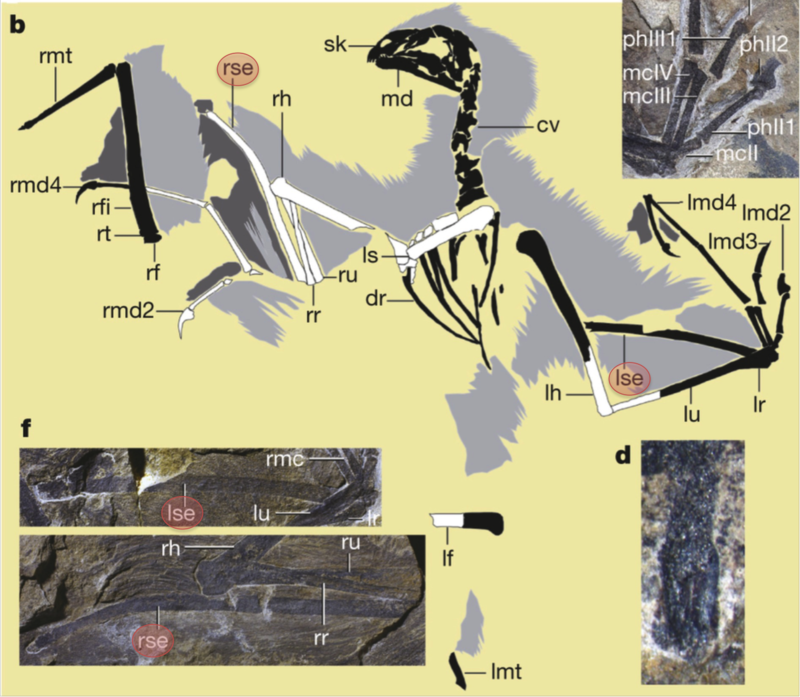 Key wing structures are labeled “ldm4/rdm4” and “lse/rse.” Light gray shading represents feathers in the fossil, while dark gray appears to be some sort of membrane. The right side of the figure, depicting the left side of this monster, shows the wing anatomy nicely. Bones with “md,” for “manual digit,” in the label are the homologues (or anatomical equivalents) of your fingers. Notice that the fourth one (“ldm4”) is drastically longer than other digits. This alone suggests some special function for this digit. Emanating from the wrist is another structure, “lse,” for “left styliform element.” In anatomy, “styl-” refers to a structure that sticks out; your skeleton is littered with “styloid processes.” Unlike digits, which are a line of several bones (“phalanges”), this styliform element is a single, rod-like structure made of bone. If you look at the “rse” above, beneath it you’ll see a dark patch running its length, which the researchers identified as “sheet-like soft tissue,” or membrane. These membranes are also found by the elongated md4s. Extended Data Figure 8 from Xu et al. Comparison of the wing structure of different flying/gliding animals. The yellow segment is the styliform element. Note it comes from the wrist in Yi qi and the Japanese giant flying squirrel, but from the ankle in the bat. Birds and pterosaurs apparently lacked such an accessory structure. 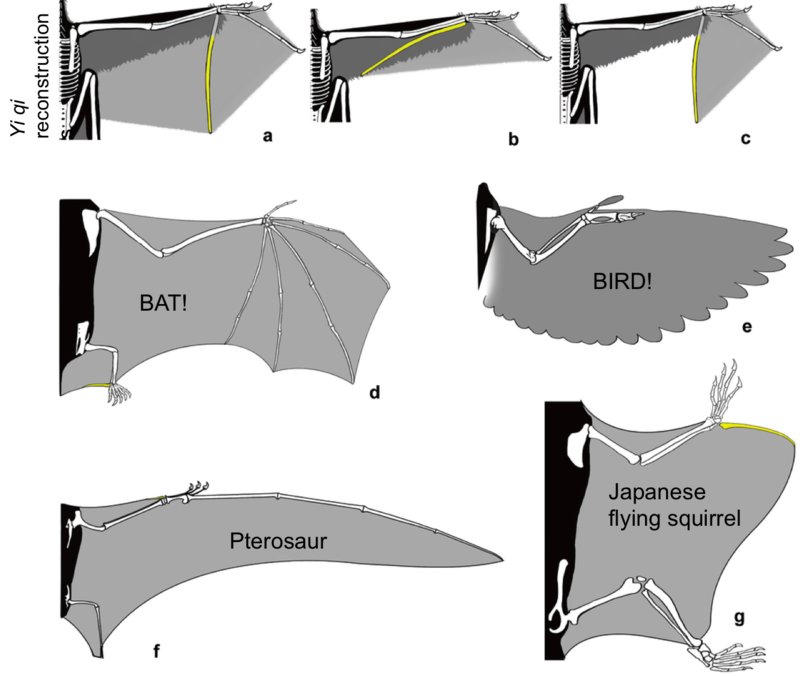 Although media generally report this animal’s wings were like bats’, the authors point out that the placement of this styliform element, at the base of the wrist, is actually most comparable to the Japanese giant flying squirrel (Petaurista leucogenys). Nevertheless, the the construction of the wing, with a membrane between long finger elements, is unlike the wings that other dinosaurs and later birds evolved for flight. This highlights the many ways that flight has evolved – independently – in different kinds of vertebrates over the past 200 million years. Like a dinosaur Edward Scissorhands. 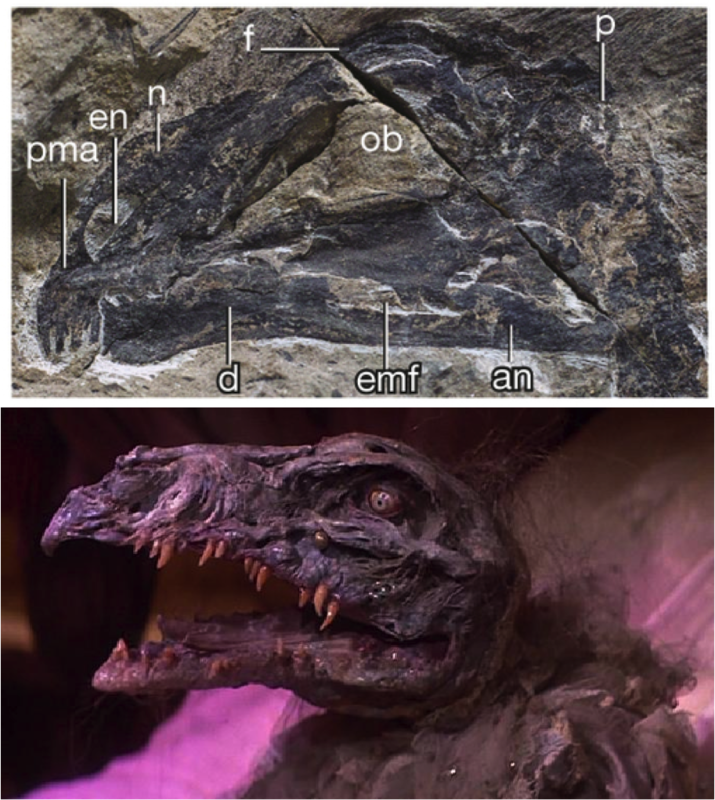 Yi qi (top) and an Skeksis (bottom). Not the first time The Dark Crystal has predicted important fossils. Yet again, paleontology shows that fact can be stranger than fiction.